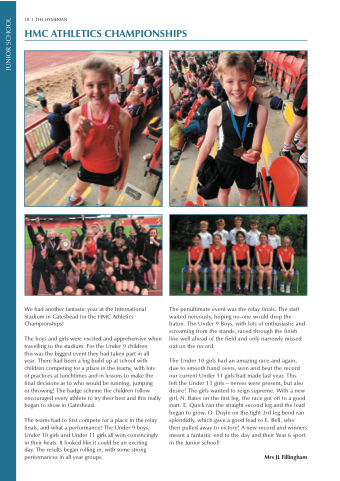 We had another fantastic year at the International Stadium in Gateshead for the HMC Athletics Championships! or throwing! The badge scheme the children follow encouraged every athlete to try their best and this really began to show in Gateshead. The teams had to first compete for a place in the relay finals, and what a performance! The Under 9 boys, Under 10 girls and Under 11 girls all won convincingly in their heats. It looked like it could be an exciting day. The results began rolling in, with some strong performances in all year groups. The penultimate event was the relay finals. The staff waited nervously, hoping no-one would drop the baton. The Under 9 Boys, with lots of enthusiastic and screaming from the stands, raced through the finish line well ahead of the field and only narrowly missed out on the record. left the Under 11 girls – nerves were present, but also desire! The girls wanted to reign supreme. With a new girl, N. Bates on the first leg, the race got off to a good start. E. Quick ran the straight second leg and the lead began to grow. O. Doyle on the tight 3rd leg bend ran splendidly, which gave a good lead to E. Bell, who then pulled away to victory! A new record and winners meant a fantastic end to the day and their Year 6 sport in the Junior school!